Building blocks should be a staple item in every child’s repertoire. Aside from providing good, clean fun, playing with blocks helps develop hand-eye coordination, encourages an understanding of spatial awareness, and exercises the imagination as your child can reach towering new heights via endless block combinations. You don’t have to be square when it comes to selecting the best blocks for your child. There are many eco-savvy options available that will entertain your little ones while leaving a lighter footprint on the planet. Natural Pod’s Tree branch blocks, Craftsbury Kids Jingle blocks, and Sakol Velcro blocks are all artfully designed choices for building your child’s creativity. Blocks are toys that may be kept forever and re-used time and time again for each and every one of your chips off the old block, making them inherently recyclable. The best first blocks for baby should be big, colorful and soft. Craftsbury Kids Jingle Blocks are handmade in the USA, and they feature a gentle sounding chime inside. Their felt letters, numbers and shapes are vital introductions to baby’s burgeoning brainpower. Craftsbury Kids is a mother-owned company with the philosophy that children should delight in specially crafted toys designed with love, that they may pass on to their own children. The company helps support independent artists, local economies and fair trade. In their continuing efforts to green their practices, they are also working on an organic cotton/wool fill version of the Jingle Blocks, which will be available in 2009. Tree Branch Blocks by Natural Pod are made from naturally fallen maple and fir tree branches on Vancouver Island. These blocks are kiln dried to stabilize the bark and the wood, and the edges are sanded to smoothness. As they are organically derived, between 30-40 blocks come in each set, contained in a cotton drawstring bag. 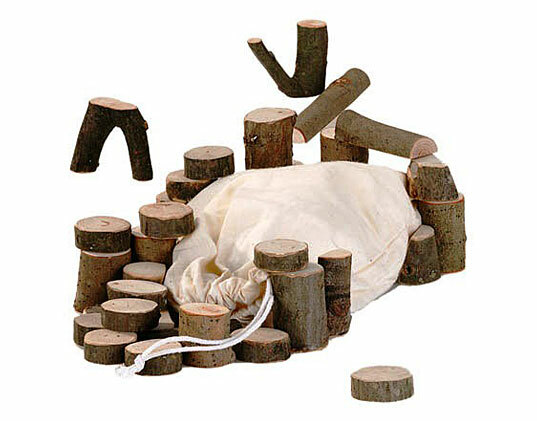 Children may take majestic trees into their hands and develop an appreciation of the outdoors with these blocks, flawlessly designed by nature. They may also embellish their creations with collectibles from a nature walk: twigs, flowers, an acorn. Sakol Velcro blocks are designed to come to life in a child’s hands. Available in sets of 5, 10 or 50, these blocks are lined with velcro, so they take on a mind of their own during the stacking and shaping process. 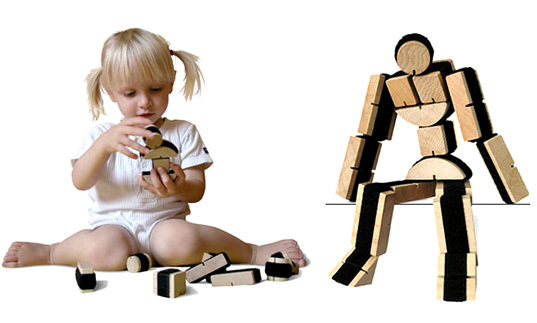 Click here to virtually play with these blocks online and you’ll be quite amazed. 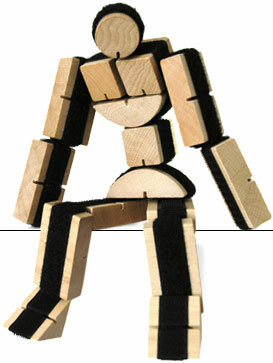 Sakol blocks are made of natural birch wood, and they are certified by the Forest Stewardship Council. With these unconventional block choices squared away, you can get busy building a college savings fund for your future architect! Thanks so much for including the Jingle Blocks among your great picks! 40dollars for some bits of a tree! cheeky. Building blocks should be a staple item in every child's repertoire. Aside from providing good, clean fun, playing with blocks helps develop hand-eye coordination, encourages an understanding of spatial awareness, and exercises the imagination as your child can reach towering new heights via endless block combinations. You don't have to be square when it comes to selecting the best blocks for your child. There are many eco-savvy options available that will entertain your little ones while leaving a lighter footprint on the planet. Natural Pod's Tree branch blocks, Craftsbury Kids Jingle blocks, and Sakol Velcro blocks are all artfully designed choices for building your child's creativity.